SPOILERS!! : Fair warning for those who haven't seen the movie yet- here there be spoilers. Any and all discussion regarding the movie can be made here. So if you haven't seen it yet, don't read further! Movefest: Absolutely no spoilers nor discussion about or involving the movie, or anything related to it (eg. characters, content, or story) should be made anywhere lse on the forums. Any threads made about Star Wars: The Last Jedi on will be moved to this off topic thread. So if your Star Wars: The Last Jedi topic disappears from General, it wasn't deleted. It has a home here. 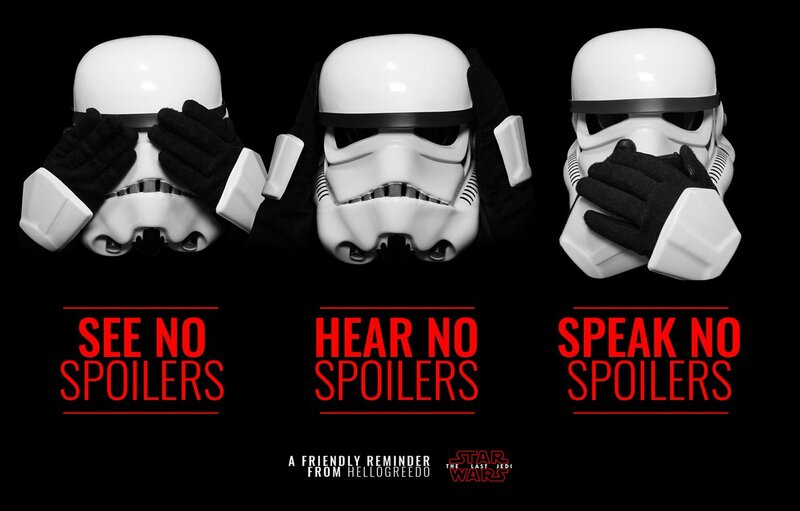 Don't be that guy: Don't spoil the movie for others. Continued posting in the wrong areas will result in administrative action. If your thread topic/content is posted anywhere outside of this thread and contains spoilers, plot reveals, or sensitive information regarding Star Wars: The Last Jedi, you will face administrative action. With The Last Jedi on the horizon, I am starting to see that ridiculous claim pop up often again, especially on YouTube. Well, here is how you can show people how silly they are being... Feel free to link my post and it should shut them up pretty fast. First of all, I am 100% positive Rey comes from the Skywalker family and her character is essentially the same as the protagonists (Luke and Anakin) in the previous two trilogies. All three characters had pretty much the same background, story development, and skill sets. Luke Skywalker - Luke was a great pilot, skilled mechanic and extremely powerful Force-user. He grew up on a desolate planet (Tatooine) and dreamed of becoming a pilot. He began using Force abilities with no training, as we saw in the trench run on the Death Star and during his lightsaber practice with the seeker droid. He picked up his mechanical skills while working with droids on the farm. He learned to fly in a T16 and once he joined the Rebellion, he quickly became one of the best pilots. Luke suddenly found himself thrown into the conflict, was trained by one of the greatest Jedi (Obi-Wan), experienced an important death (Obi-Wan) that changed his character in either a good or bad way, and eventually his story culminated in a battle with a family member (Vader). Anakin Skywalker - Anakin was a great pilot, skilled mechanic and extremely powerful Force-user. He grew up on a desolate planet (Tatooine) and dreamed of becoming a pilot. He began using Force abilities with no training, as we witnessed in the Boonta Eve Classic podrace. Qui-Gon Jinn even mentions it to his mother in one scene. He picked up his mechanical skills while working on droids and podracers. He didn't have any previous experience as a pilot until his first space battle but the podracing helped and he quickly became one the best pilots. Anakin suddenly found himself thrown into the conflict, was trained by one of the greatest Jedi (Obi-Wan), experienced an important death (his mother) that changed his character in either a good or bad way, and eventually his story culminated in a battle with a family member. Obi-Wan was essentially his brother as he said himself. Then later he fought his son. Rey Skywalker - Rey was a great pilot, skilled mechanic and will be an extremely powerful Force-user. She grew up on a desolate planet (Jakku) and dreamed of becoming a pilot. She began using Force abilities with no training, as we witnessed in the interrogation scene and when she fought Kylo. She picked up her mechanical skills while scavenging ships for a living. And as we read in the book, she learned to pilot ships after finding an old flight simulator computer in one of the scavenged ships. Rey suddenly found herself thrown into the conflict, will be trained by one of the greatest Jedi (Luke), experienced an important death (Han Solo) that changed her character in either a good or bad way, and eventually her story in the first film culminated in a battle with a family member (Kylo Ren), whom she will most likely battle again later in the series. As you can see, the three characters are nearly identical in terms of story and skills. This is why I am 100% sure that Luke will be Rey's father. They are obviously doing a continuation of the Skywalker story. They are also elements from the Jacen and Jaina Solo story in the Expanded Universe books. Both of whom had the same skills as Luke and Anakin as well, btw. If they hate Rey, they would really lose their minds if the freaking Sword of the Jedi, Jaina Solo, was in the movie instead. lol I can already imagine the outrage. But how could she possibly win a lightsaber duel with a Sith without any training, while Luke got his hand cut off in his first battle with Vader? Well, the first problem is that Kylo is just an apprentice and Vader was a Sith Lord. In fact, he was THE Dark Lord of the Sith. Snoke also mentions that Kylo needed to complete his training so he clearly is not a Sith Lord. The second problem with this argument is that Kylo was seriously injured by Chewie's bowcaster from a previous scene. This is why someone (Finn) who wasn't even Force-user was able to survive as long as he did against him. Finally, lightsaber dueling is more about the Force than actual training and skill with the weapon. If people had read the books they would have a better understanding of it. Particularly the New Jedi Order series. The Jedi had to fight an enemy (the Yuuzhan Vong) that they couldn't sense with the Force so they were unable to use it to anticipate their actions during battles. They had to rely on their lightsaber skill alone and this didn't always turn out well for some of them. Oh and Rey was also clearly skilled at fighting with her staff. But how was Rey able to fly the Falcon better than Han Solo? When exactly was it established that she was better at flying the Falcon than Han? I think people mean to say she was better at fixing the Falcon, which makes sense considering that she salvaged ships for a living. Also, she may very well be better at piloting the Falcon than Han, considering her natural Force ability and the fact that she spent so much time on the flight simulator. And don't forget that Skywalker bloodline. Also, remember that Han is not a Force-user. If anyone has any other questions they would like me to address, feel free to let me know. First of all i (mostly) agree with you. At least enough that I dont find her a bad character or constantly whine about her. But i think you understate some of her abilities, especially her competency with the force. When luke and anakin "use" the force, they aren't so much using abilities as much as being guided by in. In the trench, luke isn't willing the torpedoes to go where he wants them to, he's merely surrending himself to the will of the force. Same with anakin. He didnt "use the force" to win the podrace, he was simply being guided by it. I'm ok with rey resisting kylo's mind probe and even her summoning the lightsaber, but i think the jedi mind trick took things a bit too far. That is a very specific ability that requires knowledge and active manipulation of the force. She wasn't surrendering to the will of the force, she bent it to her will. That isn't something luke or anakin ever did before any training. Nope, I just read all of the books so I know the whole story. I really can't emphasize enough on how important it is to read the books if you want to know something. "The Force Awakens" and "Before the Awakening" novels answer all of the questions people had about Rey, except for who her parents are and we will learn about that soon enough. Rey learns how to do the mind trick when she is in Kylo's mind during the interrogation scene. She didn't just resist his probe, she entered his mind and was able to see his memories, which is why he reacts the way he did in the movie. She also fails on her first attempt to use the mind trick. Also, in the book, Heir to the Jedi, which takes place immediately following the events of A New Hope, Luke uses the mind trick before he has had any training with it. And much like Rey, he fails his first attempt. All Force abilities are innate and there are characters who can use them without any actual training in specific abilities. How do you think the first Jedi and Sith were able to use them when there was no one to teach them? Or even the first Force-users in general? You should learn about characters like Darth Bane and Lord Vitiate, who both have extremely powerful abilities that they didn't learn from other Sith. This^. Also I disagree about saber dueling having more to do with the force than training and skill. Anikan was the most powerful Jedi ever and yet he was defeated by little ole Obi-Wan? How? Because Obi-Wan was THE master of defensive light saber combat and not because he was more powerful or had a better connection to the force. Side note: I want to read Star Wars books to learn more about characters whose backstories were not able to be fully fleshed out in the movies i.e. Boba fett, Guavian Death gang etc. I don't want to be forced to read them just to make heads or tails of the latest movies. I'm all for books giving extra gratification and entertainment for people who need it, but if they're being used to cover up errors or plot holes, i think it crosses a line. If a movie can't coherently convey a story or a plot point on its own, then that part of the storytelling has failed. For example: The Clone Wars tv show gave a lot of much needed context to the prequels. It cleans up a lot of nonsensical garbage that doesn't function on its own. But does that suddenly make the prequels better movies? No. They still failed to deliver effective storytelling. I loved TFA. I thought it was far better than rogue one and probably ROTJ as well so keep in mind my criticisms aren't as severe as they are for the prequels. But my point still stands. A story needs to be a story. Only getting pieces of it then being expected to search elsewhere for the rest is a waste of time and it removes you from fully engaging. There were no errors at all. And the plot holes only exist to people who didn't read the books. I think people set expectations far too high and spend too much time specifically looking for what they view as "plot holes" in films. In a story the scope of Star Wars, its hard to cover everything unless you want to make the movies like four hours long. They simply don't have time to explain every little thing in a two hour film, which is why the books exist. Its like when the Hobbit movies were released and people were complaining about things that were left out from the book. You just can't expect them to cover everything in a film, especially one of that scope, like a Star Wars or LOTR/Hobbit film. It is just not realistic. As I said, it has been proven in the books repeatedly that a big part of lightsaber skill comes from the Force. They use the Force to anticipate the enemy's actions. And while I think everyone SHOULD read the books, you don't really need to read them to understand what is going on in the movie. I thought most of it was fairly obvious, like Rey going into Kylo's mind (do you think he had such an extreme reaction just because she resisted?) or how she gained most of her skills. I think too often people look for issues that aren't really there in the first place. Okay, that is all for me tonight. If there are more questions, I will answer them tomorrow. I understand that they "technically" aren't errors since the book explains them (convenient), but i really dont think its too much to expect for something as simple as this to either be addressed or worked around. You named the LOTR which doesnt really apply for two reasons. 1: LOTR is an adaptation from previously existing books. Compromises have to be made to coherently tell the same story, i dont disagree with you on that. But episode 7 was not an adaptation. It was a frankly, rather simple adventure story. If things got too complicated for the writers, then thats on them. 2: LOTR was really f****g good. Even though they had to cut some things from the books, they never sacrificed wholesome storytelling or omitted relevant information. Again, books are great if you want a full multimedia experience and want to fill out a universe. Spin offs make great books because you can explore stories and characters that dont fit in the primary story. Boba Fett is a good example of this. In Empire and ROTJ we know everything we need to know about him for the story to work. Hes a bounty hunter hired by the empire who knows han solo and works for jabba. Any more back story would take away from the main one. But if you thought he looked interesting, you can read more about him. On the other hand, if the scene of Vader talking to boba and the other bounty hunters was omitted from the movie and the audience was expected to read about it in a book, it would detract from the movie. 1. He defeats Count dooku single handedly after Obi-wan get thrown unconscious. 2. After the battle of Coruscant Obi-Wan recounts all the times Anikan has saved his life. 3. Obi-wan says that he has taught Anikan everything that he can. Meaning he is at least equal or greater in knowledge of the force. Yes, he was only a Jedi knight at the time of RotS, but not because of his lack of power or knowledge of the force its because of his attitude and closeness with the Supreme Chancellor. If you've seeen swtcw (canon) you will know how powerful he is in RotS (even General Grievous comments on his reputation). The plots holes and inconsistencies I'm referring to in Tfa are, in order of really bad to just weird. 1. When Poe and Finn crash on Jakku Poe disappears and never looks for BB-8 and we don't see him again until we're at the resistance base. How'd he get back to the base? Why did he give up on BB-8? It just doesn't fit his character. 2. How does Finn (a cleanup guy) get chosen to be in an attack on such a high profile target(the person who has the map to skywalker). 3. Why is finding Luke so important to the war effort? He is one guy and the FO have a giant weapon that can completely destroy multiple planets. 4. If a strong connection to the force is the only thing that you need to perform force abilities and excel at lightsaber combat why did the Jedi spend their entire lives practicing and learning about the force? Yoda says multiple times to multiple poeple that they have much to learn in the ways of the force. It never ceases to amaze me how many facts surround imaginary characters. But then, who am I to talk, imaginary is my forte. As for Rey's lineage, Daisy said she thought it was all answered in TFA. Even if we were not as certain, in her mind at least it is all there. Obi-wan beat Anakin because his style countered Anakins. Obi- wan fights in the defensive style Soresu. It relies on him to fight defensivley while looking for openings to counter attack. This is why the council sent obi- wan to fight Grevious, since Grevious is super agressive...The same as Anakin. Anakin was also over- confident in this fight which led to him making many mistakes. It's stated and shown multiple times. Luke had training from kenobi when he blew up the Death Star. Anakin was trained by Jar Jar, and was already a great pilot. That fact that readings books proves your point is a very bad backing up; you shouldn't have to buy extra material to correct a fail. Don't be a ****(4), and follow forum guidelines. So when everyone watched ANH for the first time, was it a fail because no one knew why Luke had these "special powers?" And people say I'm crazy..
yes, that's my point. Obi-Wan beat Anakin through his lightsaber combat (with a little help from Anakin's arrogance), not because he had a stronger connection to the force. I was using that to make a point about Rey. Sure she could anticipate Kylo's next strike(as could he), but she would have no formal training in saber combat i.e. perrying a certain direction to knock your opponent off balance and setting up your own counter. It's evident in the fight that she can't use a lightsaber properly when she literally pokes at Kylo almost the entire time, which is a very easy attack to block then counter. Also, the bit about the flight simulator proves how many things the writers overlooked, it would've beeen easily solved with a couple lines of dialogue. Finn: Do you even know how to fly this thing? Rey: Of course, I've been practicing my whole life on a simulator. There, a whole plot point is covered up nice and neat with only a few lines. "You don't want to sell me death sticks... You want to go home and rethink your life. " Nope, I just read all of the books so I know the whole story. Good idea, I'll catch up on the books so I can use it as an excuse of superior knowledge of a fictional universe and make others look dumb. Rey is definitely within Mary Sue range. If she goes through the next movies without getting her **** kicked (training sequences don't count) then Mary Sue will probably stick. Luke and Anakin got slapped around and got their arms hacked off, they lose sometimes. Movies 2 in both trilogies were about them losing/not being ready/consequences of a lack of control among (many) other things. We shall see, the jury is still out. Agreed. I think both sides of the arguement should drop until episode 9 is released. Kylo is going to beat Rey on Ach-to while Luke dusts up the knights of Ren. Obiwan explained the force in ANH, I don't see why it would be called a fail. Exactly. We know what the force is, and what it can do. So maybe Rey is just simply more gifted than what we've seen before?